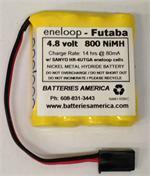 5EP1600AE: 6.0 volt 1600mAh NiMH hump pack for RC cars and other RC models. Includes universal Futaba-JR-SPEkTRUM-HiTEC-Z connector. These battery packs are MADE IN THE USA by BATTERIES AMERICA. Pack dimensions: 2" x 1.25" x 1.125". Fits in same space as 4 xAA square shape. SPECIAL WEB SALE. Weighs 4.2 ounces. 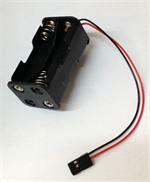 6.0 volt 110mAh SANYO Ni-Cd small scale receiver pack. Made with 5 x N-110AA 1/3AA cells. Choose shape, and choose wire leads or Connector. 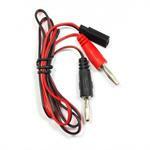 6.0 volt 110mAh SANYO small-scale Ni-Cd receiver pack. Made with 5 x N-110AA "1/3 AA" size cells. Each cell is 0.6" tall x .56 diameter. Choose Pack Shape, and choose wire leads or Connector from scroll-down menus. Pricing reflects options chosen. 6.0 volt 350mAh SANYO Ni-Cd small-scale AAA receiver pack. Made with 5 x KR-350AAAEC cells. Choose shape, and choose wire leads or Connector. 6.0 volt 350mAh SANYO Ni-Cd small-scale receiver pack. Made with 5 x KR-350AAAEC "AAA" size cells. Choose Pack Shape, and choose wire leads or Connector from scroll-down menus. Pricing reflects options chosen. 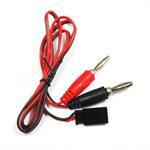 4.8 volt 350mAh HiTECH Ni-Cd receiver battery pack. Made with 4 x P-350AAA-808US "AAA" cells. Choose pack Shape and Connector. VB1500AHRC: 1500mAh Ni-MH compact high-capacity receiver packs. Made with "2/3A" size cells (1.1" tall x 5/8" dia). Choose Voltage (4.8v or 6v) , Shape, and Connector. HR4UW: FDK-SANYO 1000mAh rechargeable Ni-MH high-capacity AAA receiver Battery Packs. Made with HR-4U 1000mAh "AAA"-size cells. Choose 4.8v or 6v, choose shape, and choose connector. 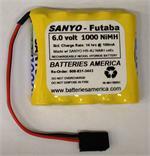 AP1000SCW : 1000mAh rechargeable Ni-Cd battery packs for RC, made with AP-1000SC cells (2/3Sub-C: cells are 1.1" tall, 0.87" diameter. Compact, high-capacity. Choose Voltage (4.8v or 6v) , shape, and connector (or wire leads). 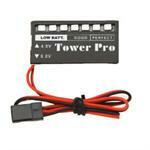 4H1650: 4.8volt 1650mAh NiMH battery pack for JR PROPO receivers. Replaces JR 4H1500. Choose higher-capacity models (if desired) from menu. Base price for 1650mAh version is $ 24.95. ASSEMBLED IN USA. 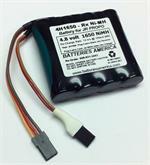 5EP1600AW : 6.0 volt 1600mAh rechargeable NiMH battery pack for R/C models. Small, compact, long-life battery pack. Choose shape & connector, or shape & wire leads. 4HR3U2500W: 4.8 volt 2500mAh Ni-MH rechargeable high-capacity receiver battery pack. Made with 4 x HR-3U2500 high-capacity AA-size cells. Choose Pack Shape, and choose wire leads or Connector from scroll-down menus. 4KR1800SCEW: 4.8 volt 1800mAh Sub-C Ni-Cd battery pack. 4KR1800SCEW: 4.8 volt 1800mAh SANYO Ni-Cd high-capacity receiver pack. Made with 4 x KR-1800SCE "Sub-C" size cells. Quarter-scale style battery pack; weighs approx. 8 oz. Choose shape & connector. 4hr3u2700w: 4.8 volt 2700mAh Ni-MH high-capacity AA receiver battery. Made with 4 x HR-3U2700mAh AA cells. Highest-quality & highest-capacity AA-size battery pack. Choose Pack Shape, and choose wire leads or Connector from scroll-down menus. 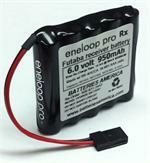 5EN950AAAW : 6.0 volt 950mAh ENELOOP AAA Ni-MH receiver battery pack. Choose shape and connector. Arrives to you PRE-CHARGED & READY TO USE ! 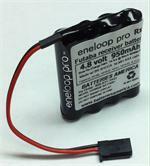 These eneloop batteries retain their charge for over a year when not in use !